You are here: Home ∼ SEMA Show next week! Vegas baby! Las Vegas is the site of the SEMA Show; once again bringing together over 2000 companies for the largest automotive show in the world. Automotive manufacturers as well as aftermarket companies worldwide make the trip each year to this oasis in the Mojave Desert. The Las Vegas Convention Center and surrounding grounds will play host to this show boasting anything and everything automotive related. While this show isn’t open to the general public, the amount of press coverage this show receives gives everyone an up close view of what SEMA is all about. SEMA is always the place to showcase new products and it has routinely given us a glimpse into the future of the industry. BDS Suspension will be among the companies making the long haul to Las Vegas for the November 2-5 show. This event provides an opportunity to meet with current and potential distributors, as well as network with other professionals. BDS Suspension will be well represented with a number of companies interested in our premium lift kits for SEMA show rigs. We’ll have more coverage of these trucks in the near feature. 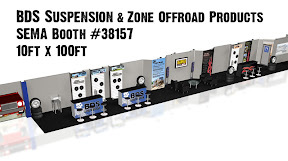 BDS Suspension is teaming up with its sister company Zone Offroad Products in our 10ft x 100ft booth modeled after an off road shop complete with sales counters, lift kits on displays, waiting room, and install garage. Wall displays will showcase new lift kits for the Jeep TJ / JK Wranglers, the 2011 Chevy HD trucks, Dodge trucks, new Ford F150 / F250 trucks, and the Toyota Tundra. We’ve included some shots of components of the booth, but we don’t want to give away everything yet, so you’ll have to check back to see the full details. Keep a look out for updates during the show and a full recap complete with media blitz after the show.